I was with my 16 year old son near London Bridge. We had been to the DC comic exhibition at the O2 and it was snowing… quite heavily. We were hungry so the obvious thing to do was to queue for an hour in the cold to go to a pasta restaurant called Padella. 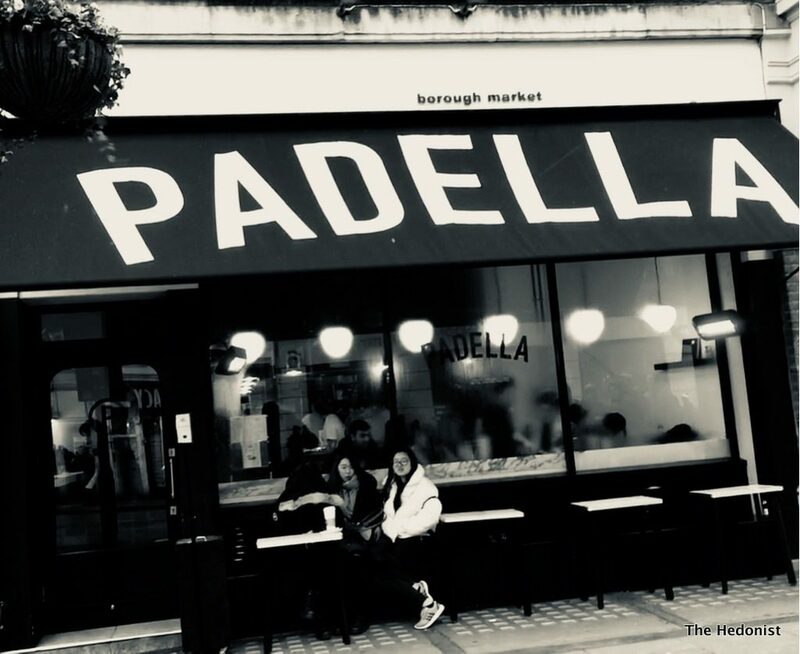 Padella is on the edge of Borough Market. There are lots of other good places to eat in the neighbourhood including another pasta restaurant just over the road; so why on earth would we risk hypothermia for a plate of ravioli? Well, Padella isn’t any old pasta restaurant. It’s an offshoot of the much loved Highbury Corner staple Trullo (see my review) and since it opened has become one of the hardest to get into restaurants in London. With its no booking policy there are constant queues full of locals, tourists and the international Instagram food bloggerati. So on the basis that it was snowing I thought it might be just a little easier to get a table…An hour later after making friends with a venerable Chinese-American couple in the queue full of tales of their Scotch pilgrimage to Islay, Mr Freeze and The Ice Man finally made it inside. We were ushered into the rather cramped basement and soon realised from the other punters that the only way to keep your table long enough to defrost was to order lots of plates of pasta. Four plates between the two of us didn’t seem unreasonable but just to keep the health police happy we ordered a dish of Agretti with Amalfi lemon. 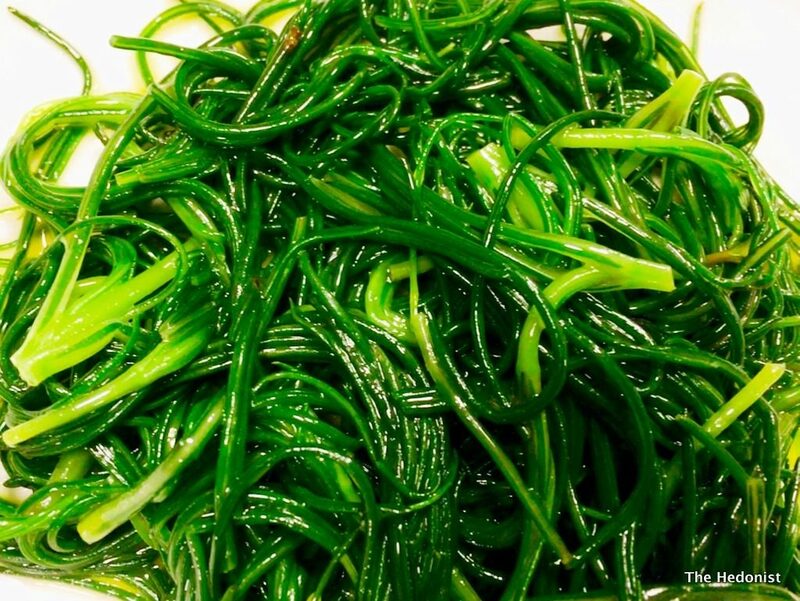 Agretti are often listed on menus as Barba di Frate (monk’s beard) which is a damn sight sexier than the English name of Saltwort. The straggly succulent leaves with a chlorophyll tang and a citrus zing from the lemon were an effective mouth freshener for the upcoming carb fest. 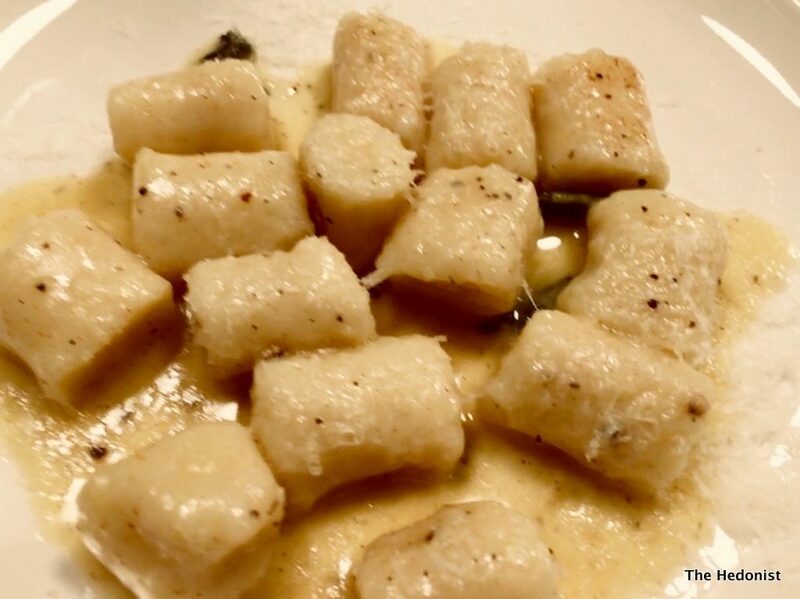 First up was a dish of pert Gnocchi slathered with an intense sage and nutmeg butter with the nutmeg adding a little sweetness to the astringent herb. I could sense the little dumplings’ joy as they danced down my oesophagus… Properly al dente Tagliarini came with a slow-cooked tomato sauce made with 2017 Confini olive oil. 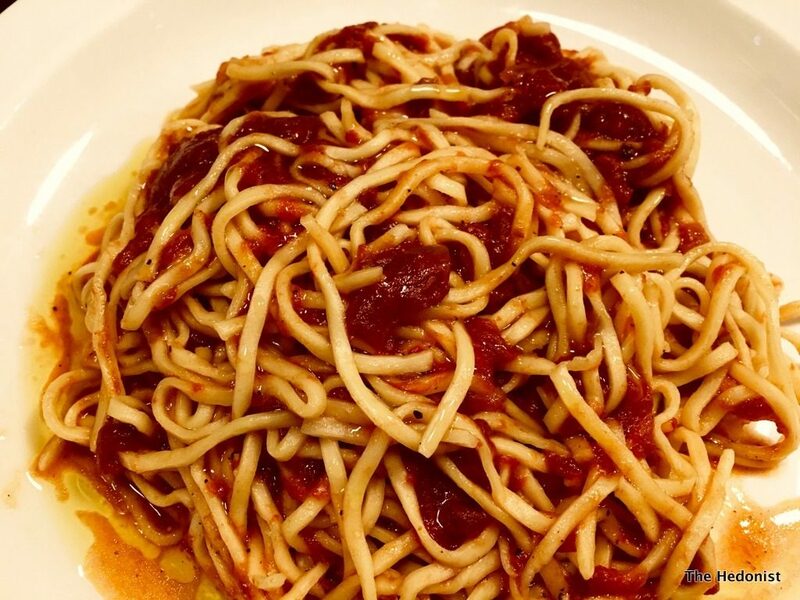 The pasta had terrific bite and the intense sauce had a deep rich southern Italian flavour that was somehow unexpected and almost shocking on a snowy day in Borough. 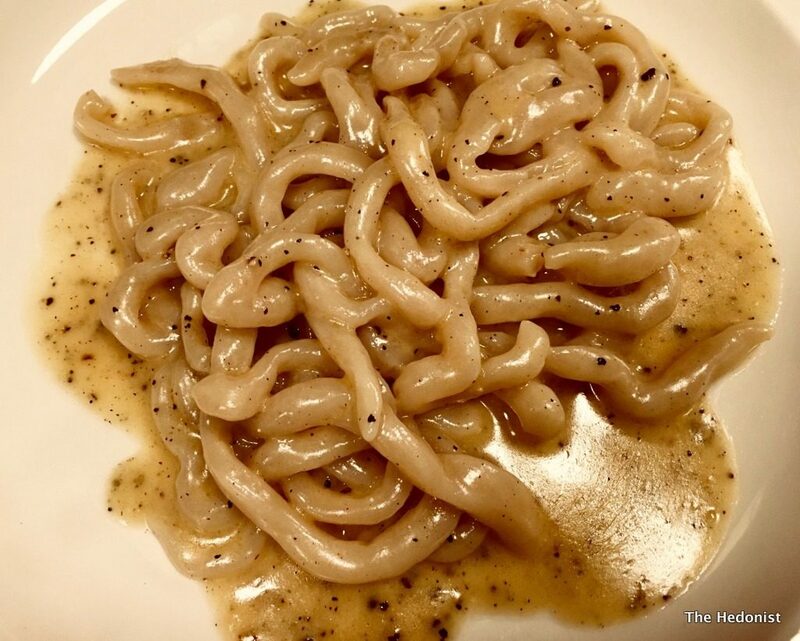 Pici are hand-rolled ‘fat’ spaghetti from near Siena in Tuscany and at Padella are served in a Cacio e Pepe (cheese and pepper) sauce. This simplest of dishes can turn into a claggy mess. But this was a full-flavoured lubricious delight. 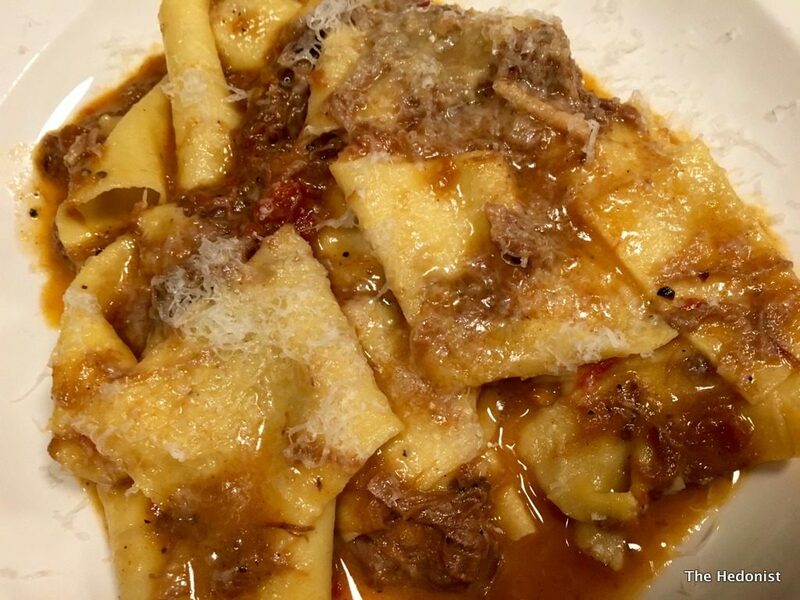 Last up was a peppery, caramelised and aromatic dish of Pappardelle with a 8 hour Dexter beef shin ragu – this was a perfect warming winter dish – rich and unctuous. 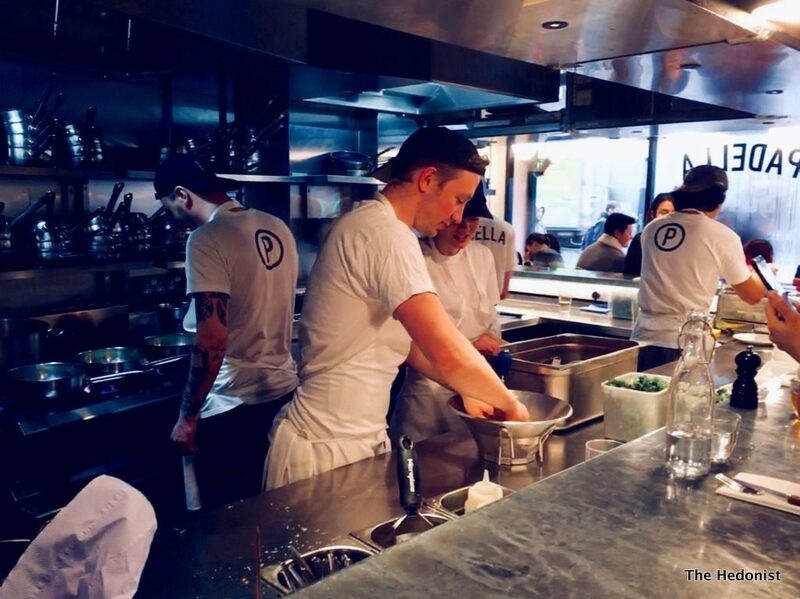 There are only a handful of places in London that make great pasta dishes and Padella is one of them. With prices around the £7 mark per dish it is affordable and whether you want to brave the queues is strictly a matter for you. However, probably because of its popularity it does feel a little as if they are doing you a favour by letting you in; but that aside, if you like your pasta fresh, beautifully cooked and intensely flavoured then you should visit.